Weddings in a large area of the eastern part of the world are celebrated in a unique way. Not only do they consist of feasts, music, dances, but also various other traditions and practices. One of the most popular practices of weddings in the eastern world is the application of henna on hands and feet by the bride, her family and the bridegroom’s family. Henna has become such an important part of the culture that it is also applied on small occasions, such as Eid and Diwali. 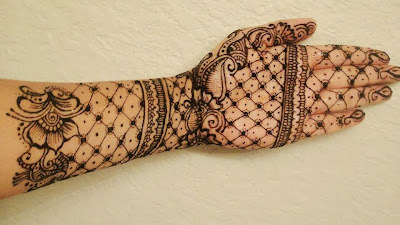 Most females have a liking of a dark shade of henna, i.e., dark brown. When it starts to fade away, they want it removed quickly. The question is how to do so? If you applied henna recently, and want to fasten the speed of its removal, follow one of the methods below, and get rid of your problem. Remember, the henna may not disappear at once. However, the cleaning solutions outlined below help you get rid of the stains in less time than it would normally take. 1. To remove henna stains from your skin, you will need a mixture of olive oil and salt. To do so, grab a bowl, pour some olive oil in it, and add a pinch or two of salt depending on the amount of olive oil in the bowl. Now, mix the two ingredients completely. 2. To apply the mixture on your hands, grab a cotton swab, dip it in the bowl, and start rubbing it gently on the henna stains. Change the cotton swab once it dries out. 3. Keep massaging the stained area till the color starts to fade away. 4. Wash your hands normally with soap and water once done. 5. Follow the above steps for 2 to 3 days, at least twice a day, to get rid of the henna stains completely. Darker stains may take slightly longer. If this method does not work or you do not have the required ingredients, then follow the methods written below. 1. The first step involves the formation of the cleaning solution required to remove the henna stains from your skin. To do so, grab a bowl and squeeze out a lemon in it. Add 2 teaspoons of soda powder to the bowl, and mix thoroughly. 2. Next, take a big cotton pad or swab, and do one of the following: Either dips it slightly in the solution such that it does not get completely soaked, or pour the liquid on the pad such that that solution does not drip through the cotton. 3. Now, place the cotton pad on the stained area, and put tape around it so that it remains in place. 4. Leave the cotton pad in place for few hours. Darker stains may require the cotton pad to be left for longer. 5. Remove the tape afterward. 6. Wash your hands normally using a soap and water. The henna would have disappeared by now. Your hand is completely clear now! Henna tattoos are must try and have especially during summer, but the stains after the tattoo fades is something not good looking at all. Good thing there is something that we can do to remove the stains, coz' we don't want to end up looking like a blackboard just like the ones from Grademiners.com review. How do i stop golecha colored henna from bleeding past the design on skin? henna tattoo designs are temporary, still anybody wants to remove, the techniques which you were explained will useful to them.